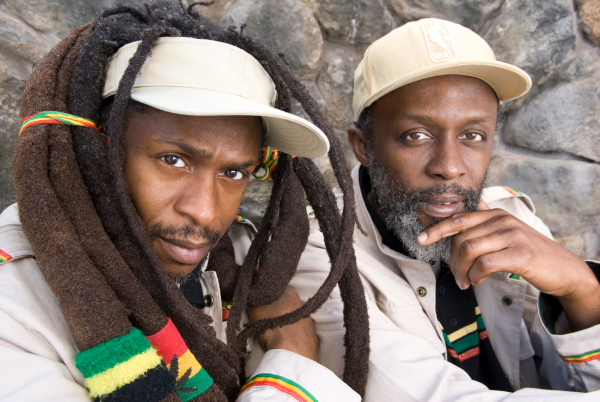 Steel Pulse is one of Britain's greatest reggae bands, in terms of creative and commercial success. The band was formed in 1975 in the inner city area of Handsworth in Birmingham, England. The founding members were schoolmates - David Hinds (the primary songwriter as well as the lead singer and guitarist), Basil Gabbidon (guitar), and Ronnie "Stepper" McQueen (bass). All of them came from working class West Indian immigrant families, and none had much musical experience. They took some time to improve their technical proficiency, often on roots inspired material by the Wailers, Burning Spear and several other prominent Jamaican artists. McQueen suggested the group name, after a racehorse, and they soon fleshed out the lineup with drummer Steve "Grizzly" Nisbett, keyboardist / vocalist Selwyn "Bumbo" Brown, percussionist/vocalist Alphonso "Fonso" Martin, and vocalist Michael Riley. Initially Steel Pulse had difficulty finding live gigs, as club owners were reluctant to give them a platform for their "subversive" Rastafarian politics. Luckily, the punk movement was opening up new avenues for music all over Britain and also finding a spiritual kinship with protest reggae. The band wound up as an opening act for punk and new wave bands like The Clash, the Stranglers, Generation X, Police, and XTC, and built a broad-based audience in the process. In keeping with the spirit of the times, Steel Pulse developed a theatrical stage show that leavened their social commentary with satirical humor; many of the members dressed in costumes that mocked traditional British archetypes (Riley was a vicar, McQueen a bowler-wearing aristocrat, Martin a coach footman, etc.). Steel Pulse's debut album, Handsworth Revolution was released in 1978 and was soon hailed as a classic of British reggae by many fans and critics, thanks to songs like the title track, "Macka Splaff," "Prodigal Son," and "Soldiers." Steel Pulse's sophomore album, 1979's Tribute to the Martyrs, featured other key early singles with "Sound System" and "Babylon Makes the Rules," and solidified the band's reputation for uncompromising political ferocity. 1980's Caught You showcased a more pop-oriented set devoted to dance tracks and lovers rock. In 1982, True Democracy, became their first charting LP in America, making both the pop and R&B listings. The follow-up, Earth Crisis, was released in 1984 and won a Grammy for Best Reggae Album. In 1988, Steel Pulse released State of Emergency, their most explicitly crossover-oriented album yet. They also contributed the track "Can't Stand It" to the soundtrack of Spike Lee's classic Do the Right Thing. In 1991, they released another heavily commercial album, the Grammy-nominated Victims, which featured the single "Taxi Driver." Backing up the song's views, Steel Pulse filed a class-action lawsuit against the New York City Taxi and Limousine Commission, charging that drivers discriminated against blacks and particularly Rastafarians. The 1992 live album Rastafari Centennial earned another Grammy nomination. The following year, Steel Pulse performed at Bill Clinton's inaugural celebration, the first reggae band to appear at such an event. In 1994, the band released the studio album Vex. 1997's Rage and Fury was nominated for a Grammy. In 1999, the group released another collection of live performances, Living Legacy. Fast forward a long seven years and Steel Pulse would return yet again, this time with African Holocaust, which earned them another Grammy Award Nomination for Best Reggae Album of the year. To this day, Steel Pulse remains as one of Britain's greatest reggae bands having remained true to its roots for 45 years. The band maintains a sense of fierce integrity as it continues to share the message of love and justice. The band is renowned for its commitment to fighting injustice, educating the masses and promoting positive messages through spiritually uplifting music and we are happy to have them returning to Boonville this June.